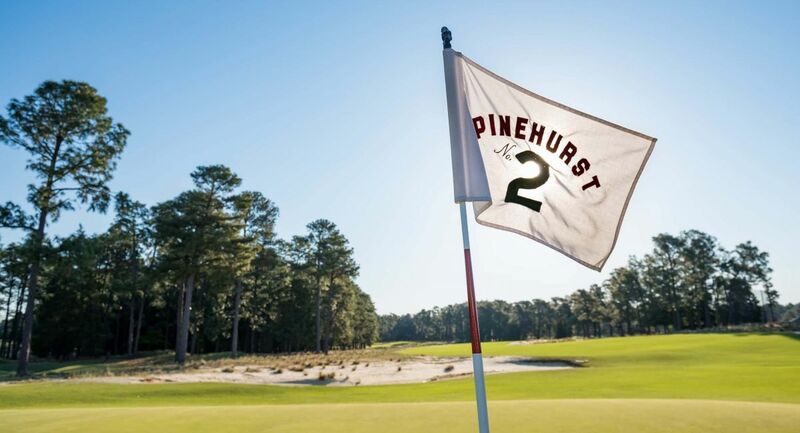 Experience the legacy of golf course designer Donald Ross by playing some of his most well-known works during a trip to Pinehurst and Southern Pines. Donald Ross turned North Carolina sand and scrub into hallowed golfing ground. After heading to the U.S. from Scotland, where he apprenticed under Thomas “Old Tom” Morris at St. Andrews, Ross was hired by James Walker Tufts to design golf courses at Pinehurst Resort. Among those was Pinehurst No. 2, which became his most famous and is one of the top-ranked courses in the world. He went on to design dozens of golf courses across our state, and about 40 of them are still in play. Experience Ross-designed golf courses for yourself during a 3-day weekend in Pinehurst and Southern Pines, the area known as the “Home of American Golf.” Here are three different ways to plan your trip. Pinehurst Resort members and guests have priority when it comes to tee times, so plan on spending at least one night. Choose from traditional rooms and suites at AAA FourDiamond rated Carolina Hotel and its sweeping verandas or The Holly Inn, the resort’s original accommodation. Other options include The Manor Inn and onsite condos. Ross’ designs dote on the details. None were overlooked during No. 2’s $2.5 million renovation, which was completed in 2011. They included removing rough, adding 13 tees and modifying the greens on 15 and 17 to increase hole locations. They returned the course to the time of Ross, whose former home and beds of championship roses sat behind the third hole’s fairway. There’s plenty to do off the course at Pinehurst Resort. Forbes Travel Guide gave four stars to the spa, while other activities include tennis, swimming in the outdoor pool, and kayaking and fishing in the 200-acre private lake. You’ll eat well, too. The elegant Carolina Dining Room serves dinner and a Southern-style breakfast buffet, which is a longtime favorite of guests. Overlooking No. 2’s 18th hole, The Deuce serves lunch, small bites, cocktails and North Carolina craft beers. Southern Pines Golf Club is another early Ross project. Succeeding on this public course, which features his trademark crowned greens, requires contemplating, not ripping, your drives. Take time to walk it, which creates the opportunity to better appreciate the thought that was put into its design. After a long day of golf, you’ll need a place to retreat. Pine Crest Inn, which Ross owned for almost 30 years, is the appropriate choice. It offers traditional rooms with two beds, the private Telegraph Cottage with two queens and a single, and Snore Rooms, which become two rooms in one by closing an interior door. Replay your game and those of fellow duffers at the inn’s sometimes boisterous Mr. B’s Lounge, which is regularly rated one of the country’s best 19th holes. Drink up its mounds of memorabilia, and try a round with the indoor chipping target, a game that supposedly originated with Ross. If you’d prefer a less competitive spot to enjoy your libation, the porch is lined with rockers. The inn serves breakfast, Sunday brunch and dinner, when the 22-ounce porterhouse pork chop with mashed potatoes, vegetables and pan gravy has been the choice for more than 60 years. More restaurants, along with a variety of small shops, are within walking distance. Try family-friendly Pinehurst Pizza or Elliott’s on Linden for farm-to-table cuisine. Staying at select hotels and inns in the area, such as Pine Crest, allows you to take advantage of golf packages to play at other Ross-designed courses, including Pinehurst Resort’s No. 1 and No. 3. It also makes it easy to stop by Tufts Archives inside Given Memorial Library for a lesson on local golf history. Its collection includes photos, memorabilia and course sketches made by Ross. Aerial photos from the Tufts Archives helped put the course at Mid Pines Inn and Golf Club back to Ross’ original 1921 configuration during a restoration a few years ago. The work included widening fairways, creating sandy roughs and reconfiguring bunkers. It earned Golf Magazine’s 2013 Best U.S. Course Restoration award. It’s a great example of how Ross’ routing creates spectacular views and great golf. The 18th hole, 411 yards from the back tees, is a favorite. It’s uphill to the green and finishes outside The Inn at Mid Pines, which offers traditional Southern hospitality and 103 rooms. Villas with kitchenettes are available, too. Dining options include breakfast, Sunday brunch, lunch and dinner at The Terrace and Dining Room or lunch at Pop’s Lounge. You’ll find the pool across the street at The Lodge at Pine Needles on a second Ross-designed course. It offers chalet-style lodges, which can accommodate you and up to seven of your golfing buddies, along with classy dining rooms and quick bites at the In-the-Rough Lounge. As Mid Pines did in 2013, Pine Needles replaced bent grass with Bermuda grass on its greens in 2016. That’s almost a century after Ross and his groundskeepers pioneered replacing oiled sand and clay with an earlier Bermuda variety. Pine Needles Golf Course plays vintage Ross. On the par-3 third hole, for example, your shot needs to be strong enough to clear a pond and wetland but land below the hole on a green that slopes back to front. If your game needs a tune-up, Pine Needles offers private lessons and Golfaris, which combine instruction and relaxation. Those and its golf academy will develop your complete game, giving you strategies to successfully navigate any course. And that would make Ross proud.